When food is life it's hard to imagine restricting your calorie intake or denying yourself of your fave snacks, but that's the sad reality for lots of models today, who need to stay skeletal in order to get booked on the runway and succeed in their careers. This was life for model Liza Golen-Bhojwani, until she gave it all up to become the happier, more fulfilled version of herself and live her best life off of the runway. We couldn't be more here for the fact the fashion industry is finally employing a wider range of body shapes than just ironing boards to model their designs on runways around the world. Better late than ever, hey. Heck, even scientists have proved plus sized women are having a positive impact on our mental health, and you can't argue with science. But it is rare that the models themselves, the ones subject to these unrealistic standards, actually speak out on the pressures and pitfalls of being in the industry. One inspiring model doing exactly that however, is drop dead gorgeous Liza Golen-Bhojwani, who's now a perfectly healthy size 10 after ditching the cut throat world of catwalk modelling - and has since become miles happier and healthier for it. She's taken to Instagram to share her story, posting a side-by-side before and after shot to highlight the difference in her body. Captioning the photos, she explained: “The left side was me at the start of the peak of my career. My first proper fashion week where I was actually the size I needed to be. ​I was booking amazing shows that one never thinks they actually could, walking with girls who I once looked up to, it was a serious adrenaline rush...but after fainting one night in my apartment whilst preparing one of my very low cal meals (I think it was 20 pieces of steamed edamame if I remember correctly), I called it quits with the diet and workout regimen I was put on and decided I could do it on my own. "I thought to myself, I can still be this thin, but I'll just eat a little more so I don't feel so horrible. Well, eating a little more turned into eating nearly a bag full of almonds, which then turned into eating full size meals, which then turned into a full blown binge. I was craving every single food you could imagine and I was giving in to every craving even though I knew this was such an important time in my career. "​I made it through NYFW okay, no one had noticed any weight gain, but by the time I had gotten the LFW I could see the pounds starting to show both in the mirror and on the measuring tape, but I kept quiet obviously not wanting to sabotage myself. I found myself going to the grocery store and picking up raw vegetables to try and make up for the near two week binge I had in NY, but I didn't see any weight coming off no matter how "healthy" I was eating and no matter how many workouts I fit in. "MFW came and I knew I was bigger and by bigger I mean a 35.5in hip rather than the 34.5in hip I started with in NY, I played it cool and just pretended everything was normal. I did end up booking shows, Dolce & Gabbana being one of them. Which I afterwards received online criticism about my thighs looking fat...Anyway PFW came about, and I found it impossible to resist those chocolate croissants. "In 2014 I got a kick, a rev of my engine, I wanted to get in shape again, I was over giving up. I wanted in again, but in a much healthier way.... And I did just that, I worked my a** off day in and day out in the gym. I was strict about my diet, but I wasn’t fully starving myself like I had two years ago. "In 2012 I was having about 500 calories a day, whereas here in 2014 I was having about 800–1,200 depending on my mood and hunger patterns. I was the fittest I ever was in my entire career at this point, I had six-pack abs, but still I wasn’t fit enough for the likes of Victoria’s Secret or other brands. We couldn't agree more. 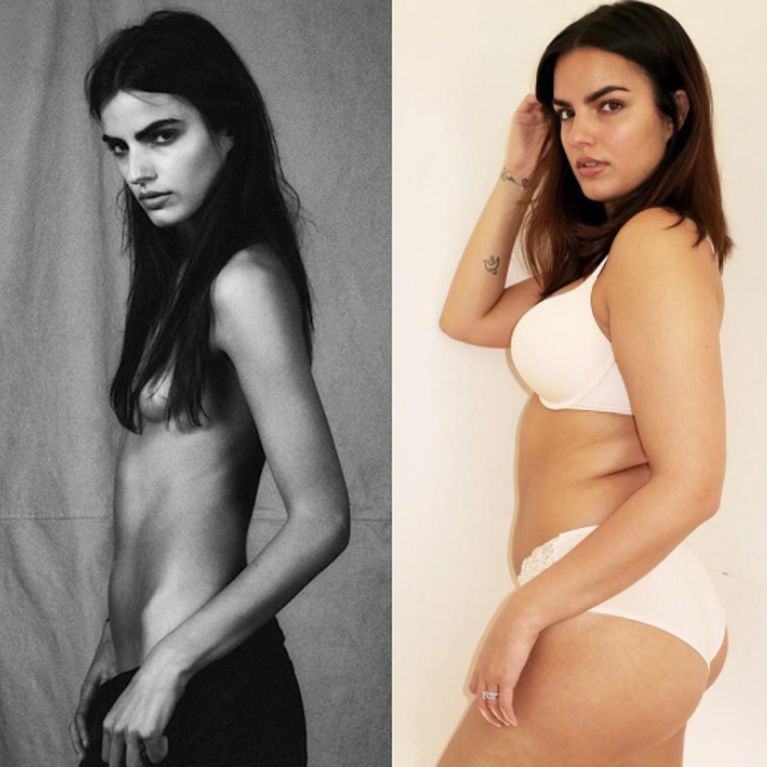 We think Liza looks ah-mazing embracing her natural shape, and it sure is refreshing to see such an honest account of the gruelling reality of adhering to the strict and unattainable ideals of modelling. Now pass us the chocolate croissants!